As a student of the world–that’s my ego-boosting term for “starving artist,” I’ll have you know–I’ve read a lot. Recently I’ve focused my powers of observation on the various corruption allegations in the footballing world. Ricardo Teixeira, Brazil’s FA (CBF) chief, a FIFA Executive Committee member, and the head of Brazil’s World Cup organizing committee, ranks right up there with the most oft accused and so it wasn’t so shocking that last Saturday, October 1, The Economist published an article discussing several of the allegations pending against him. There was nothing new in the article about Mr. Teixeira, especially not if you’ve seen the BBC Panorama’s episode “FIFA’s Dirty Secrets,” but it did contain a few paragraphs that might raise some eyebrows around these parts. During his campaign to replace Joan Laporta as president of FCB, Sandro Rosell claimed transparency would be so complete as to render the Camp Nou practically see-through. Good luck taking a mid-match bathroom break. Failure to be institutionally transparent aside, The Economist points to personal transparency problems for Sandrusco. The gist of it all, boiled down to a single sound bite, is that Rosell may have been involved in several shady deals with the CBF and Teixeira while a part of Nike and later as the head of the marketing firms Ailanto and Brasil 100% Marketing. There have not been any charges filed against Rosell, as far as I know, and the accusations remain in that gray area between rumor and fact that characterizes most of the things on the Internet. It would be foolish, however, to dismiss these allegations outright. Rather, investigations should run their course–transparently; in the meantime, we should neither think Rosell guilty nor suspect his other business ventures, personal or with Barça. However, it strikes me as important to mention Joan Laporta at this stage. The former president of Barça has been accused of getting into financial foreplay with an Uzbek company and using FCB as a way to earn a lot of money for himself on the side. That deal fell through (you can read about it here and here), but the calls for resignation and, later, greater institutional transparency were fierce and loud. There was a vote of no confidence and now accusations of falsifying Barça financial holdings. Court cases are ongoing in that as well. Whatever we think of Barça the football team, we shouldn’t lose sight of the fact that tens of millions of euros are involved in everything behind the scenes. The TV rights money, the salaries, the facilities. All of these things create the opportunity for graft and corruption that we’ve seen in other parts of the game. While overzealous attacks on any administration are counterproductive, it behooves the common fan and especially the socis to be mindful of those who would bandy about the term “transparency” but refuse to answer questions relating to their prior business deals or current projects. If Laporta was a loose cannon on the field of financial fire, we should be wary of his first Vice President and that VP’s past dealings with the (allegedly) shadier elements of the game. That, again, doesn’t mean we should attack Rosell, but it does mean we should demand answers to questions concerning the Qatar Foundation deal and the general state of finances at FCB. They aren’t suspicions founded on anything; in fact, they’re not suspicions at all, they’re just questions that, as a soci, I feel entitled to be able to ask and get answered honestly and with documentation. Yup, it’s a podcast with me! Previous Post Can You Spot The Genius? In a way he already is, as the lack of the promised transparency is a big blight in his Rose(ll) garden. The lovely ladies of @fcblive have posted a translation of this fantastic “conversation” between Pep Guardiola and film director Fernando Trueba. Read it. Go now. You won’t regret it. Woooow, thanks for sharing that! Cada ser humano es un especie de animal distinta. Tú no vas a hablarle igual a la girafa, al elefante, o al chimpancé. These guys are too much. So awesome! Thanks for posting this. Rafina with the goal 2-1 Barcelona B. Just onside with a pass inside the box. Lovely combination play from Cuenca to Rafinha. Cuenca did a wonderful job of slowing the game down and then accelerating it at the right time. Not sure if Rafinha was onside or off. But it was close. Rafinha put a beautiful finish on the ball. Alcorcon have gotten a couple perfect chances at scoring from headers. It’s not the height is the positioning of the defense that’s the problem. Also – the B team just went up 2-1 – and Eusebio substitutes in Rodri for Espinosa? I just don’t understand that. You’ve just went up in the match – 10 minutes or so remaining and you remove a ball control midfielder for Rodri? I can understand taking out Espinosa if you think he’s tired. But he has to be replaced by another player who can maintain possession, especially how suspect the B team has looked this season at the back, particularly on the counter. It’s in the 86th minute. Ever since the second barca goal. Alcorcon has really stepped up the pressure. 90th minute equalizer by Alcorcon. Cross into the box. Header from the left side to the right of the goal. Alcorcon are repeatedly getting guys open in box and just trying to cross it into them. Very poor from the B team. Keeper boots the ball up to the left winger. crosses the ball and the center backs just get beat. They are not looking sound at the back this season. I think it was Armando who just got beat for that goal 1 vs. 1. Rodri misses a golden chance to win the game in extra time. Dos santos (I think) had a golden oppurtunity one-on-one with the keeper. Tried to 5-hole the keeper and didn’t hit it hard enough. Probably a good save by keeper. If we’re thinking of the same play – I believe that was Rodri. The B team really needed a win out of this match today – if only for their confidence. They keep having very costly breakdowns at the back, especially on fast transitions. Why does Armando keep playing? It’s great that he’s older – but he’s not good. Same for Carmona. At this point it just seems as if they are playing due to their age. I’m still mystified as to why you would take out Espinosa only to sub in Rodri when maintaining possession of the ball is critical to closing out the game. Im just as perplexed why Carmona played the full game.Its one thing if green players like Gerard or Rafinha make poor decisions but the experienced players are supposed to be there to guide the team.If Carlos is ‘running’ into dead ends and shooting on sight im not sure how hes helping with anything. The only decent thing Carmona did in this game was get in the way of the Alcocorn players, and a tree could have done that just as well. Cuenca, JDS and Tello were very good. Espinosa & Rafinha were good as well. Deulofeu had some excellent moments but just couldn’t make the difference. Both of the Alcocorn goals were entirely preventable, and as captain and CB Armando must take much of the blame. I hope Bartra gets off the injury list soon. Another great article out of The Economist. I never liked the weasel. Why doesn’t anyone like him??? I feel like I’m of the few on Team Sandro! With power comes corruption..that’s just the way things go. So, you concede that he might be corrupt, and yet you like him why? Playing devil’s advocate, one man’s corruption is another man’s compromise. When it comes to politics, no one is clean. Not necessarily a good thing but it might not be bad either. I’d like to have confidence in him and think that he’s doing pretty well except for a few things(selling our souls to Qatar, alienating non-catalans from being socios). He isn’t stepping on Pep’s toes, he appointed Zubi as sporting director which was awesome, and he’s slowly but surely reversing the financial effects of Laporta. What won me over was when I found out that because of him, Ronaldinho came to Barca. I will forever feel grateful to Rosell for that. He hasn’t exactly done anything criminal nor has he let all hell break loose therefor, personally I hold no ill feelings towards Sandro. Ok, Spain, be very afraid. The Tartan Army is on its way to Alicante. The fact of the matter is 2014 isn’t that far away and now is the time to start experimenting with the younger players. On another note..what the hell does Victor Valdes have to do to get more minutes? He’s so underrated and much better than Reina! I cannot understand why he isn’t the second choice keeper. Wouldn’t it be horrible if he “pulls a Lippi” and assumes he can win the next tournament by using last tournament’s winning team? The fullbacks and strikers especially need a looking at, as there are so better options that haven’t gotten called up yet. Happy birthday to John Lennon..he would have been 71 today and the world would have been a better place! A tribute by awesome little guy. Looks like Jordi Alba will get a start in the SPA/SCO game, as Albiol has suffered a fractured cheekbone and is out. Jordi Alba is a former Barcelona youth player, right? Yeah, he’s got Barca origins. Quiet in here. Still Tuesday coming up fast . . .
ok, so keita could miss 12 matches with us in january and february, since Mali qualified yesterday for the african tournament. but follow the link, read it and see another great picture of “huh? what?” in action. credit to kxevin for the awesome nickname. thoguh others might despise it, but this is wonderful news for me. Time for JDS or Sergi roberto to step up and get a few games. Wish Mali all the luck. They do have some good players especially the silky kanoute and Md sissoko. Hope they reach the finals. Zambia and mali are the teams for me in ANC. also we have reduced our african dependence quite a bit. We had 3 starters in ANC some 3 years back. Party Boy (aka Laporta) was in court Monday in connection with his Uzbek adventure, aka corruption/kickback charges. That joy is just beginning, and might turn out to be a bigger complexity to him than the intramural contretemps. –Krkic is snarking again about how happy he is at Roma, and he deserved more of a shot when he was at Barca, etc, etc. He says he wasn’t happy because he didn’t get the chance that he deserved. Sighhhh. I may be biased, but I remember Pep giving him chances time and time again, and him screwing up o getting injured (that’s plain bad luck) most of those times. Pep can be obsessive, stubborn, and (well I can’t imagine other character flaws in him) but he is certainly not unjust. The ladies of @fcblive have done it again. Translation of David Villa’s El Pais interview. Great stuff! Thanks to the arrogance of Mou and Cristiano, and the success of our team, Messi being the best player in the world, and helping Spain’s NT win the world cup, Barcelona is now the most popular team in Spain, and EE is the most hated one. haha, yuppp. It’s funny because Real Madrid is the second most loved team in spain while Barcelona is the second most hated. In a totally non related manner, Pep Guardiola has made Barcelona the second most hated club! It was obviously Messi. I mean, he took the Ballon d’Or away from Spain when Xavi/Iniesta should have won it. 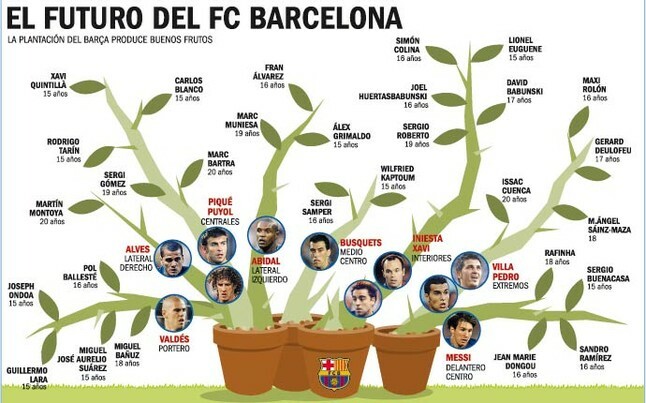 Right, but Marca says Spain’s NT now is more influentiated by EE than Barça. Of course they seemed to have forgotten data of the WC. So to be accurate, Madrid is the most hated team, then Atletico, then Sevilla and then Barça. And taking into account that most of those haters come from Madrid…well thanks Pep for that! It’s safe to conclude this is a victory for football! And mushrooms everywhere! Bojan: “My feelings for Barça are very large. It was [my] home; I cried and laughed at Camp Nou. “When I left my first thoughts were: ‘I’ll never watch any game’ because I [knew] I will feel sad, but the first game, the SuperCopa Clasico, I could not help it. Neither the second [game] nor the third. And so today I watch all of their games. “Every time I see a Barça game, I feel privileged to have shared so many years with them and have been important in many moments. “Barça has taught me many things from very young age, not just at football; in the La Masia, in training, in tournaments… It has taught me to live. I feel privileged to [have been an] FCB player and had the opportunity to play at that club. (about the old times): There were no failures, there were no sad days, always marked, and we won trophies. It was a bit unreal. And I needed to realize how life is. “Being a Barça player is extraordinary. Enjoy being in a historic team, are important at times. Close to home, family… Everything is extraordinary. “But I’m a footballer and, ultimately, I missed playing football. Especially the last year, knowing everything was outstanding. (on Pep): Guardiola is the best coach I have had and Barça will have. “Results he gave at time he entered Barça wasn’t easy, and yet he accomplished all in first year. And team is continuing its success today around the world of football because of him. (on last months with Barca): “During the final months there I did not get much of a chance to play, and for a player this is very important. “There were times when I was not that good because of lack of confidence or performance but there are other times when I thought I could play but opportunity never came. (on Roma move):“When Mom called me and told me happily that the Roma [deal] is done, I had mixed feelings. “It opened the door to a big club where I could restore confidence, but I came to mind of the twelve years at Barça. And I never imagined [wearing] another shirt. “Four years in locker room are many and the people I lived with were extraordinary. I see them as peers, as friends, not as footballers. For example Iniesta, Puyi, Xavi, Valdes, Gerard … I have lived so many things with them. (on the possibility of returning to Barca): “[It’s] Up to me and depends on football; I can return to Barça or I can stay here or wherever I go. In the end, in life you never know what will happen. @CanalBarca Bojan pasó por el programa de TV3 #elconvidat y dijo: “mientras esté Guardiola no regresaré al Barça”. Acusa a Pep de su salida. my spanish is bad, if google translate got it right, he said he won’t come back to Barça as long as Guardiola still the coach..
for complete interview in spanish, look at @CanalBarca or @OpinionCule.. Seriously, Bojan? You think you should have been subbed into that game ahead of Keita (who had a fantastic season and was a rock in the midfield for much of the CL campaign), Puyol (Captain Braveheart), or Afellay (reward for his excellent performance in the game against Madrid)? When you have already admitted that your play had been inconsistent all season, and a CL trophy was on the line? And you further think that Pep consciously left you out as a personal slight? Honestly, this boy needs to get over himself. He was promoted much too early and has an inflated idea of his own importance. who the hell does bojan think he is? whatever little chances he had of coming back has been messed up. i think scoring a cartload of goals in the juvenile barca teams has gotten into his head, not to mention the extreme affection he enjoyed from barcelona. if a 70m ibra was kicked out after one year and 21 goals, and a 130 goal eto’o was kicked out for disrupting dressing room, a 20 yr old toothless bojan can get kicked out for whatever reason for all i care. how dare he question pep.